BAT tips to publishers and creators are now instant! Previously, BAT tips would take up to 7-10 days to appear in the publisher dashboard. With our new update (live now! 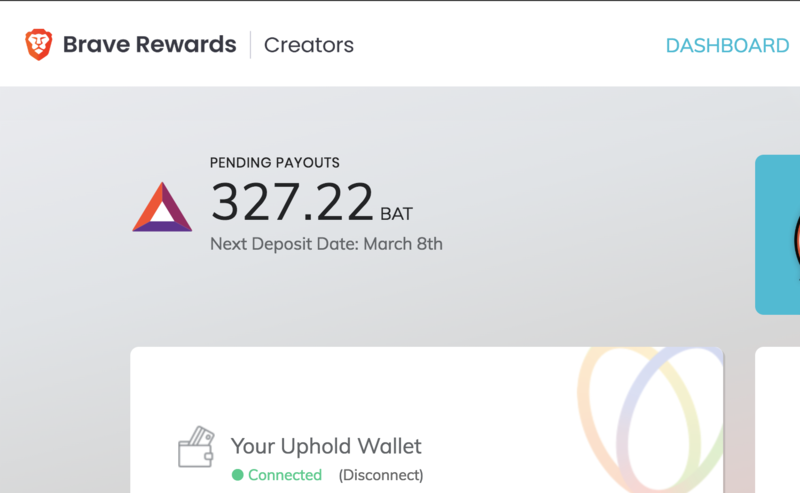 ), BAT tips via Brave Rewards will appear in the publisher/creator dashboard within minutes from the time they are sent by Brave users. We are excited to roll out this highly-requested feature, and look forward to sharing more amazing BAT & Brave developments with you—our cherished users and creators! Let’s give a round of applause to the developers and engineers who made this possible! This is one of the best features you guys just rolled. Thumbs up… Let me try it and see. Yeah! Great work guys. I tried and it worked. Within 5 minutes my tip received in my wallet. But another question, maybe not directly related to this topic. I sent a tip of 10 BAT and I only got 9.5. What happened? Is this the business model of Brave? Is it for gas? I am curious, please can you explain? I sent a tip of 10 BAT and I only got 9.5. What happened? Is this the business model of Brave? Is it for gas? I am curious, please can you explain? Thanks @eljuno for the quick response. I think it’s important to decrease this fee in the future as promised in the FAQ. For now it’s ok.
We’ve been running into some server errors for the publisher dashboard recently which has delayed updating on the tipping balance. Please keep checking back periodically, thanks.